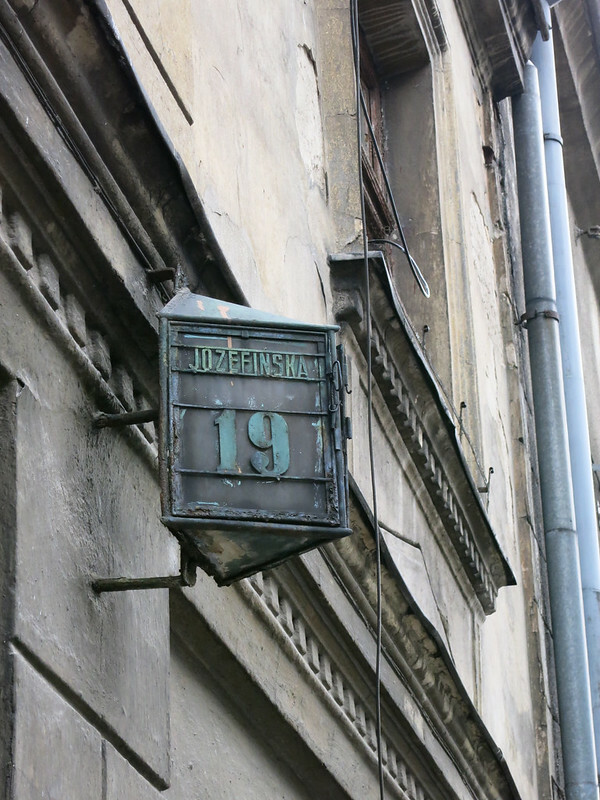 The former Jewish ghetto in Krakow. 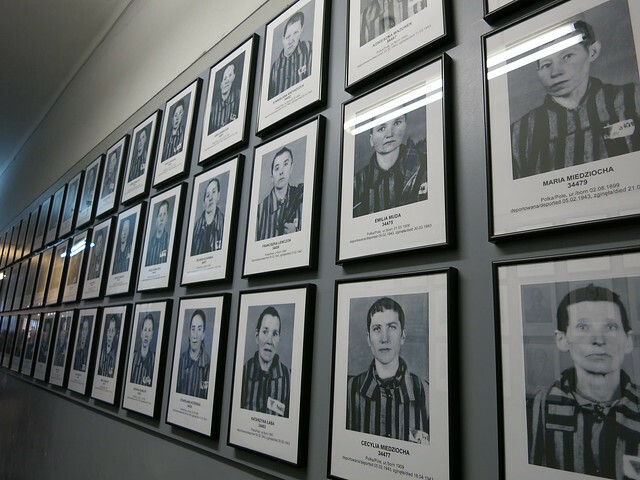 Our main reason for going specifically to Krakow in Poland was to visit the Auschwitz camps. How could we not? For me personally, to bypass such a visit was akin to ignoring the horrors of what happened. We just didn’t realize just how much happened there. The Jewish Ghetto Memorial in the place where tens of thousands of Jews were deported to the nearby death and labor camps. 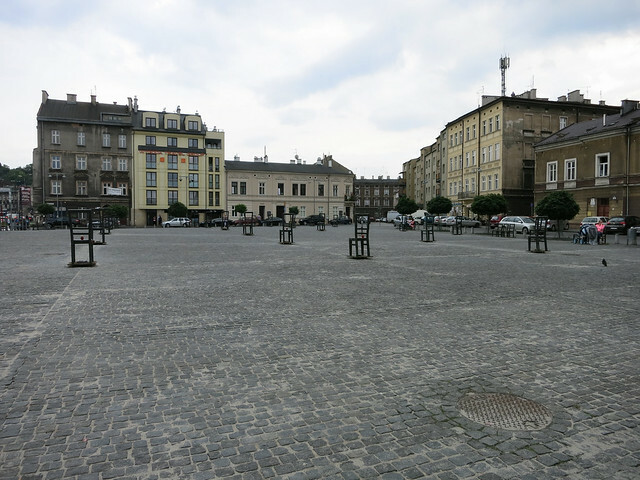 As we walked through the former Jewish ghetto, I suddenly realized that I was walking in the exact spot where about 15,000 Polish Jews were forced to relocate and live in cramped quarters, and where they were eventually massacred or herded onto trains bound for the nearby concentration or death camps. Jews being deported from the ghetto in Krakow on March 1943. 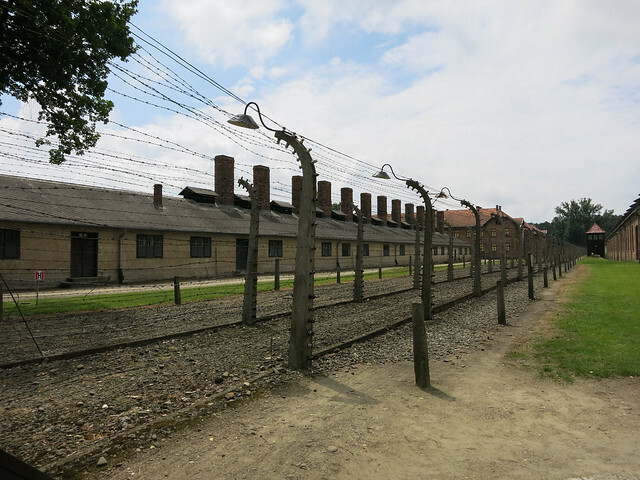 The next day, we took a day trip to Auschwitz I and Auschwitz II-Birkenau. In the minibus, we watched a sobering documentary of Alexander Vorontsov, a Soviet photographer who was assigned to document the liberation of Auschwitz and his experiences there. Once at Auschwitz, we were introduced to our guide, a very knowledgeable Polish woman who told us to keep in mind that we were about to pass through a mass graveyard. Barbed wire fence at Auschwitz I.
Headshots of prisoners at the camp, before the Nazis did away with photographing and started tattooing numbers on them instead. 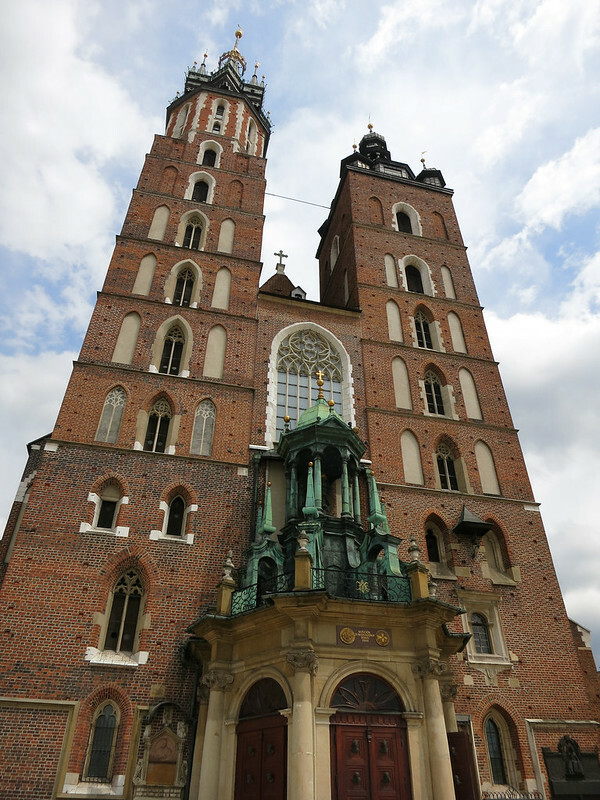 We arrived in Krakow sore and sleep-deprived after a 14-hour overnight bus ride from Vilnius, Lithuania on Ecolines. Why so tired? Imagine being confined to one seat on a Greyhound bus for 14 hours, during which the man behind you sounds like his phlegmy lungs are trying to eject themselves from his body, directly onto the back of your head. When the bus stops every once in a while, he and his son run off of the bus to chain-smoke furiously until the bus leaves again. During the night, you are abruptly disrupted from your sleep to find the man’s face inches from yours, wedged between the seats of your row, a la Jack Nicholson in “The Shining”. Thankfully, he wasn’t being creepy (or homicidal) and was just getting something from the bag resting on the floor between his legs. But still. We sleepwalked to our hostel, showered and wasted the rest of our precious day in Krakow by passing out for the rest of the afternoon in our private room. So much for getting some rest on a night bus. We all have someone in our lives who is an insufferable alkohole when they drink. 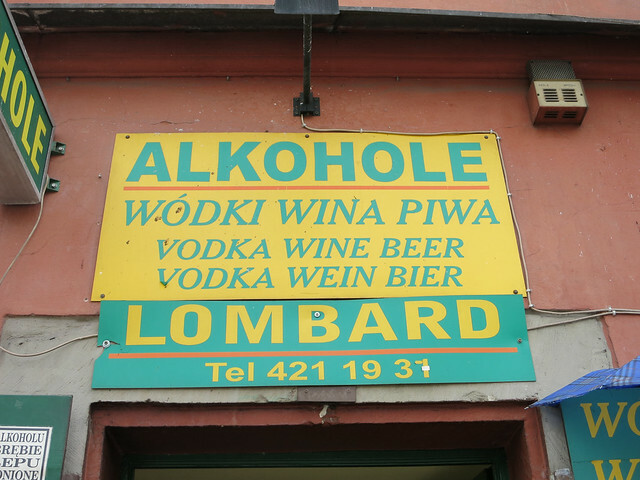 Don’t be an alkohole. Enjoying a coffee while N gets her hurr did. 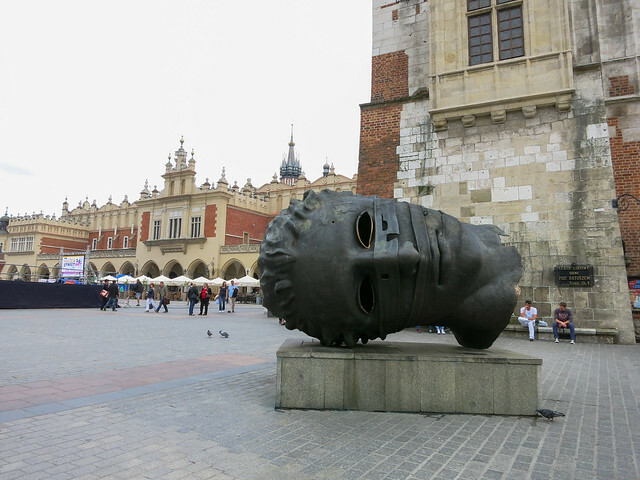 Krakow, a city of cheap booze, severe hipster haircuts and most of all, a terrible wartime history. We spent the first half of our day getting N’s haircut at a hipster place right in the Old Town. Everyone was being given asymmetrical haircuts which looked as if the stylist forgot to cut the other half of their clients’ hair and left it at that. We convinced N’s stylist to NOT cut two upside down triangles into the back of her hair, and we were off to explore Krakow. The colorful interior of St. Mary’s. You might recognize this from the movie, Schindler’s List. We walked through the Old Town and snuck into St. Mary’s Cathedral through the “prayer only” section because we didn’t want to pay to get in. 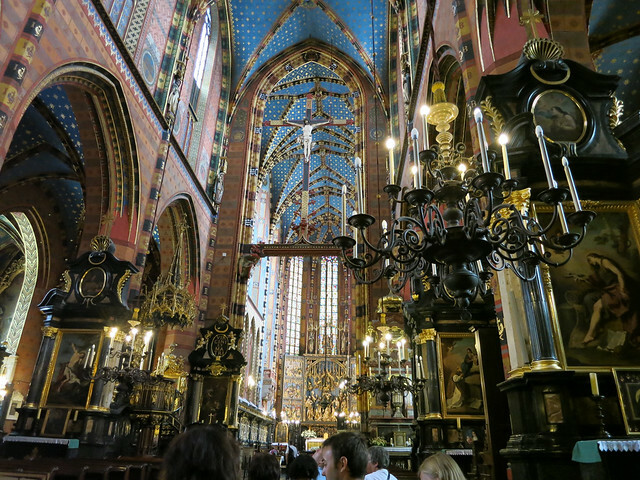 We snuck a few photos of this colorful, marvelous cathedral as we sat in the pews. After walking all over town in the heat, we took a breather (and lunch) at a restaurant in the Jewish district of Kazimierz. As much as I like meat and potatoes, it was nice to have something a little more vegetable-based and refreshing for once.